Medieval and Early Renaissance Style Paintings. Commissions welcome. FLEMISH PAINTING PRACTICE: Based on the Portrait of Giovanna Tornabuoni 1488 by Domenico Ghirlandaio. Painted after her death at age 18. 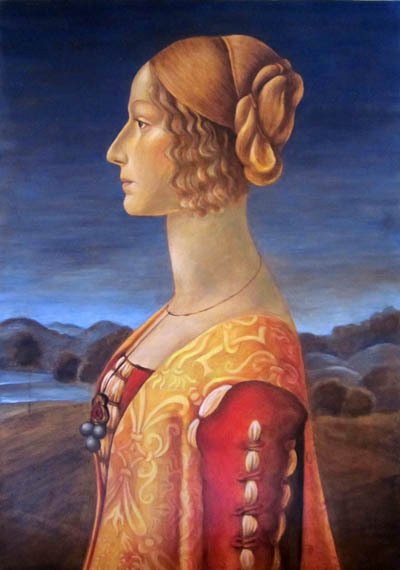 Medium: Egg tempera on gesso board with 23c burnished gold. "Who is like God", "Like unto God"
NOTES ON MICHAEL: "The first Angel created by God, Michael is the leader of all the Archangels and is in charge of protection, courage, strength, truth and integrity. Michael carries a flaming sword that he uses to cut through etheric cords and protects us from Satan and negative entities. Michael conquered the fallen Angel Satan, was in the Garden of Eden to teach Adam how to farm and care for his family, spoke to Moses on Mount Sinai and in 1950 he was canonized as Saint Michael, "the patron of Police Officers," because he helps with heroic deeds and bravery. Michael also has an incredible knack for fixing electrical and mechanical devices, including computers and automobiles. If your automobile breaks down, call on Michael. Michael helps us to follow our truth without compromising our integrity and helps us to find our true natures and to be faithful to who we really are. Other times when you may find Michael helpful is when your job is too demanding with impossible deadlines to reach, when you have an addiction, if you're very ill and suffering from a degenerative disease or terminal illness and when you suffer from nightmares." © 2012 RAYNBIRD MEDIA. CHRISTCHURCH , NEW ZEALAND. ALL RIGHTS RESERVED.